There’s a new sheriff in town in Canada. New laws passed in January of this year are requiring Canadian ISP’s to send a notice of copyright infringement to all of their subscribers. The notice comes with a warning of piracy and a fine of up to $5000. The law is also potentially requiring VPN providers to begin logging subscribers’ IP addresses and activity; a practice that many VPN providers are refusing to do as it is their policy not to do so. VPN providers who do not begin to keep data logs on their subscribers will face substantial fines. Many VPN providers are shutting down their Canadian servers in order to avoid the law and protect the anonymity of their subscribers; ofcourse the purpose of a VPN in the first place is anonymous internet surfing. The new law has already garnered the attention of at least one US Company taking gross advantage of the new law for profit. 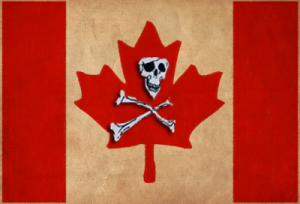 RightsCorp Inc. took the ball and ran with it sending thousands of piracy notices to ISP subscribers in Canada notifying them of the suspension of their ISP service and demanding a cash settlement well in excess of the capped $5000 limit set by the actual law. The notices being sent to ISP subscribers are relatively harmless warnings, for now. Many Canadian citizens are ignoring the warnings and turning to VPN service providers, especially ones who offer torrent downloading. The Canadian government is turning its eye toward VPN providers, requiring them now to keep data logs of all their subscribers for at least six months. The debate as to whether or not VPN providers should fall under the category of telecommunication provider is still ongoing, but for now, Canadian law officials are insisting on forcing VPN providers to begin keeping data logs and enforcing penalties for violators. Several VPN providers have chosen to stand their ground by refusing to keep data logs of their subscribers and have reassured their customers that they will never do so. They have also begun an exodus of their Canadian servers, shutting them down to keep their customer’s privacy and anonymity secure. A surge in searches for VPN providers, especially those who allow torrents on all their servers, has blown up the VPN market in Canada with some companies seeing a 100% increase in sales. VPN providers like IPVanish, VyprVPN and LiquidVPN are experiencing a higher volume of subscribers since the beginning of the year. VPN providers such as LiquidVPN are turning to or are already allowing the use of torrent file sharing on their servers making sharing encrypted files a target for many governments who feel that average citizens should not have the ability to keep their information private. The US has tried to pass such laws in the past and have failed; the laws voted down by citizens who refuses to give up their privacy. Policing copyright infringement is a gray area at best since there really is no real way of telling whether or not the file being shared is a pirated copy or a personal copy or whether or not the file being shared is being shared for profit. For now, the notice is a bland attempt to thwart potential pirating; veiled threats at best with no indication of prosecution. VPN providers will simply take their business elsewhere if the Canadian government decides to turn up the heat. For now, many are staying put and going about business as usual, reaping the benefits of the surge in subscriptions to their services. As more and more governments insist on keeping a close eye on what the people are doing in their private lives, the need for the people to take back their freedoms and liberties is being felt and more people are demanding their governments’ stay out of their private lives. Time will tell how successful the Canadian Copyright law will be and how many other governments will follow suit.